Note: This help file describes the way the Motion Tracker Parameter Group works in Final Cut Pro X. The Motion Tracker parameter group works differently in other hosts. Show Tracker Path: enables the track indicators even when the Tracker Analysis Mode is disabled, thus allowing visualizing the tracking data while viewing the results of the applied tracker. Tracker Analysis Mode: Enable this control to begin motion tracking. Be sure to move to the first frame of your clip before you enable this option so that you set your starting tracker location at the first frame. Then if you press Play/spacebar or step through the media, the filter calculates the tracking data. When you select this checkbox, the chosen effect does not display but you instead see the results of the tracking process overlaid on the tracking source layer. Once you finish computing the tracking data you must then TURN OFF the Tracker Analysis Mode to return to normal effect operations. Note: See the “Understanding the Tracking Process” section to learn more about the Tracker Analysis workflow. Tracker Center: Use the Tracker Center control to define the center of the region which will be tracked. Note: See the “Understanding the Tracking Process” section to learn how to use the Tracker Center to adjust tracking during an effect. Tracker Channel: controls which channel of the source media is used when analyzing motion. Some footage may have more distinctive features suitable for tracking in alternate channels. Target Width: sets the size of the target to be tracked. A white outline indicates the selected area. Search Width: sets the size of the area searched on each frame during the tracking process. Objects containing faster motion may need a larger search area. Smooth Motion: allows averaging out small noise/bumps in the tracker path to create an overall smoother trajectory. Higher values produce greater amounts of smoothing. Offset X and Offset Y: offset the effect on the X and Y axis respectively. This is useful if you want to track one area, then apply the effect to a different area. For example, you want to blur out an athlete’s name on a t-shirt but don’t want to blur the player’s number. However, the player ‘s number offers more contrast and is therefore easier to track. You would track the number, then offset the effect to obscure the name. Tracker Influence: allows blending between the position of the tracked object and the value of the normal position picker to which the tracker has been applied. This for example allows a point to maintain part of the character of its original setting while also being partially affected by the tracked motion path. Extrapolate Motion: menu determines how the position calculated for the tracker behaves in regions before and/or after the frames actually tracked. Start Tracking Frame: provides an offset if you wish the tracking to begin on a frame other than the first frame. End Tracking Frame: allows terminating the tracking prior to the end of the clip if desired. Look Ahead Frames: specifies the maximum number of frames the tracker can be advanced from the last rendered frame without triggering a warning message. Higher values allow you to skip farther ahead in the timeline while still maintaining successful tracking but they require you to wait for the tracker to compute the track on all intervening frames so if this control is set too high you may experience delays when jumping ahead in the timeline while the tracker catches up. Motion Tracking is a powerful feature, but it can be complicated especially with some limitations that exist in certain hosts. To understand best how to track, you need to understand the Tracker Analysis Mode and Tracker Center control. 2. Enable the Tracker Analysis Mode. 3. Set the Tracker Center position to the region you would like to track and adjust the Target Width and Search Width if desired. 4. Adjust the other Motion Tracking parameters as necessary. See “Tips for Setting Up the Target Area” for more information. 5. Tracking needs to proceed in order from the beginning to the ending of the clip. You can jump ahead from the starting frame or a previously tracked frame as long as you don’t jump farther than the value set in the Look Ahead Frames parameter. The easiest way to track is to hit the spacebar to play through the footage frame by frame. Alternatively you can step through the footage jumping ahead by no more than the number of frames set frames in the Look Ahead Frames parameter. If you jump ahead in the timeline beyond the last tracked frame by more than the time specified in the Look Ahead Frames parameter a Rewind error message will be displayed. See “Understanding Error Messages when Tracking on the Fly” for more details in dealing with that situation. 6. If you wish to retrack after tuning the tracking parameters, be sure to hit the Reset button to clear the old tracking data if you have changed the search width, target width, color space, or accuracy since the previous tracking pass. If at any point you wish to regenerate the motion tracker data (e.g. after tweaking a param such as the Search Width or Tracker Channel) you can force the saved tracker data to be purged by making a tiny change to the Tracker Center control which will then allow you to retrack from scratch. When Tracker Analysis Mode is enabled, the program renders a line along the bottom of the Composition window indicating the location of tracked frames. The line references the length of the edited source clip in the timeline. It is important to note that this line is actually rendered onto the image when you are in Tracker Analysis Mode mode. Make sure to turn off Tracker Analysis Mode before you render to disk or export your effect. 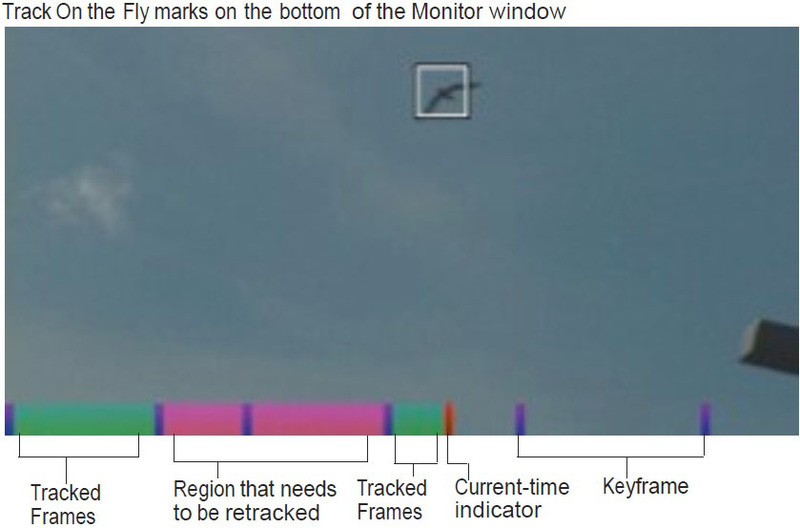 Magenta marks indicates frames which were tracked, but for which the tracker point has changed. This usually indicates a region that needs retracking (unless you are manually positioning the Tracker Center without making keyframes in your timeline). Note: When you track an effect, marks for each tracked frame draw on the left of the playhead because there is tracking data for these frames. If you jump forward in the effect farther than the amount allowed by the Look Ahead Frames parameter. This may happen when scrubbing in the timeline or when playing in the timeline if the host jumps forward too far in an attempt to maintain realtime playback. 2. Increasing the value of the Look Ahead Frames parameter may minimize the instances of this tracker error. The Tracker Center position controls set up the area to track. Use the Tracker Center control to set up your tracking region, then adjust the Tracker Center position control if necessary for finetuning. 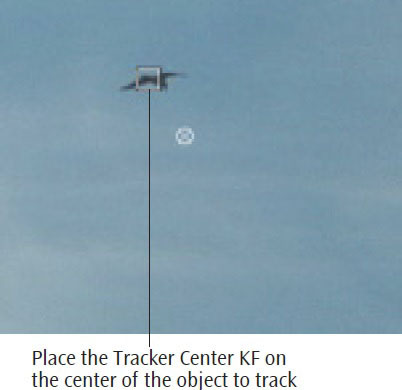 It is sometimes necessary to “help the tracker along” when it loses the object by keyframing the Tracker Center control. The motion tracker treats any frame as keyframed if the Tracker Center position at that frame is different from the track center at the previous frame. Keyframes appear in blue along the bottom of the preview when Track On The Fly is on. If you have created two Tracker Center keyframes with different values and are not using Hold interpolation, the tracker will treat each point between these keyframes as being at a keyframe. You can move the current-time indicator to the point where you lost tracking, adjust the tracker, and continue tracking, You will notice that the tracked frame markers turn from green to magenta when you do this. This indicates that the Tracker Center is different from the current value. This method works unless you go back to an earlier frame with the Tracker Analyis Mode checkbox on. If you go back, the tracker retracks that frame using the new (incorrect for that frame) value of Tracker Cente, and the final render will jump. Since you haven’t saved the Tracker Center value for the start of the effect, you will have to re-enter it and retrack. Note: If you use this method, we recommend that you disable the Tracker Analysis Mode as soon as you finish tracking, so you don’t inadvertently change the tracker data. Final Cut Pro users need to use Linear keyframes, as Final Cut Pro doesn’t support Hold keyframes. However, you need to be careful when doing this. Put a Linear keyframe at the last frame before the tracker loses tracking, and another Linear keyframe at the point where the tracker loses tracking. Put a new keyframe at the location of the object where tracking was lost and proceed. It is essential that the two keyframes be exactly one frame apart. Otherwise, the tracker assumes there are keyframes between them, and interpolates between the first keyframe (where the object was at the start of the effect), and the second keyframe, where the object is when tracking was lost. This causes the render to jump between these keyframes. To make a second adjustment you need two more keyframes. For example, you set a tracker point at the beginning of your effect, make an adjustment at frame 30 and another at frame 60. With Hold keyframes you can put the first keyframe anywhere between the beginning and frame 29, the second keyframe at frame 30 and the third at frame 60. However, since Final Cut Pro does not support Hold keyframes, you need to put the first keyframe at frame 29, and the second at frame 30. You need another keyframe with same value as the one at frame 30 at frame 59, and then the final keyframe at frame 60. When you trim a clip that has been motion tracked, the filters do not purge the tracked data. This means that if a clip is trimmed from the end, you do not need to do anything. If a clip is trimmed from the beginning (or if you slide the clip, which is the equivalent of trimming from the beginning and end), you can either compensate with the Tracker Time Offset control or force retracking by making a slight change to the Tracker Center control which will invalidate the previous track. 1. Park the current-time indicator on the frame where you want to pick up tracking and add a Tracker Center keyframe.